It wouldn't make sense to spend a bunch of money on a diaper pail only to find out that it doesn’t do the job you were hoping for. While there are a lot of trusted brands to choose from: Ubbi, Munchkin, Dekor to name a few, choosing which is the best and what each one does is what makes picking one tricky. Today, we'll be getting to the bottom of the great diaper pail debate by comparing the performance of some of the best diaper pails, so you feel confident that you’re getting the best diaper pail of 2018. Below is our picks for best diaper pails on the market in 2018. Each diaper pail has a different characteristic from the other because some might have unique features which give them an edge in the quest to be the best diaper pail in 2018. If you’re thinking that you’d rather just use a regular trash can and save the money, trust us, it’s money well spent. A diaper pail is not only a much less stinky method of disposal; it’s also much more hygienic. With that said, let's take a look at the best diaper pails for 2018. 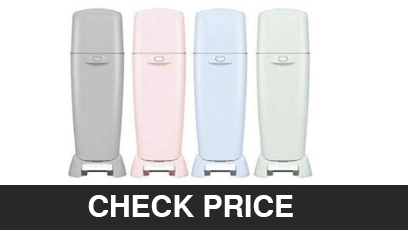 The Good: The Ubbi Steel Diaper Pail is made from sleek steel that makes it an attractive match for the nursery. It also has a protective child lock that prevents the toddler from sticking a hand inside. The Bad: It doesn't have a foot lever and so you are forced to use your hands to open it. The Summary: The Ubbi Steel Diaper Pail isn't just an alluring design, but it's also made of steel and is well-crafted which prevents the odor from seeping to the outside. It's easily one of the most cost effective diaper pails because you can use regular trash bags which is nice to not have to worry about when compared to other diaper pails that are bag specific. What We Love: It's durable and is available in 13 colors which means you can easily find one that compliments the nursery's interior design. Plus, all of the designs are really adorable. The Bottom Line: The Ubbi Steel is ideal for parents who are particular with safety features as well as style. The child lock is an innovative feature that will keep any curious toddler away and is a feature that makes it stand out to other diaper pails we reviewed. The Good: The Playtex Diaper Genie Expressions Diaper Pail is designed with a unique clamping system put in place to fully contain the odor. It also uses special bags that utilize a clamping system that seals the diaper which is a nice touch. The Bad: Diaper Genie has special bags which are unique to this model and come at a price which forces you to spend a little more long-term. The Summary: The Playtex Diaper Genie Expressions has a squeezing mechanism on its special bags which is responsible for sealing off the bad odor, this mechanism makes this diaper pail. What We Love: Thanks to the clamping system, you will not experience the nasty odors emanating from the diapers every time you open the pail. The Bottom Line: It is ideal for those parents who want to control the odor, it's trusted an has thousands of reviews and you can order bags right from Amazon which added convenience. The Good: The Munchkin STEP Pail has a step-lever that makes it fairly easier to change the bag when compared to other diaper pails we reviewed plus it seals the top of the bag when it is closed. It also sprinkles baking powder on the diaper every time the lid is opened and closed for extra stink protection. The Bad: The sealing mechanism can easily get your hand stuck. Its baking powder refill cartridges are also an extra expense if you want something cheaper over the long term. The Summary: What really makes the Minchkin STEP Diaper Pail is the baking powder cartridges which are an impressive accessory that helps you contain the odor appropriately and makes this diaper pail stand out from the rest. What We Love: Changing the bag is easy because all you need to do is to step on the lever for a quick release. The Bottom Line: Super convenient, ideal for those parents who would like simple tasks like unlocking the bag or sprinkling the baking powder effective in an almost automated manner. The Good: The Diaper Dekor Plus has a strong powdery scent and uses special bags that make oder control a breeze. We also like that the trap door quickly opens when a diaper weighs down on it. The Bad: The refillers are expensive, which can be difficult to maintain on a small budget. The Summary: The trap door lets you just drop the diaper with very minimal effort thanks to the foot lever as well. Plus, it does not have the contraptions that might get your hand stuck while at it. What We Love: If you find it costly to buy the special bags, you can use regular trash bags which fit perfectly, this can cut down on the cost over the long term. The Bottom Line: Perfect for those parents who are not looking for anything too sophisticated, that works simply and gets the job done. 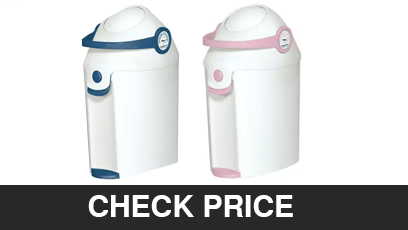 The Good: The Baby Trend Diaper Champ is the most cost effective pail on the market as it is cheap and accommodates almost any bag that you want to use. All you have to do is put the bag on the hole and swing a lever to drop it. The Bad: The pull-a-lever-to-drop mechanism can unleash a bad odor into the room. The Summary: Not only is the Diaper Champ cost-effective but durable as well with a strong exterior, meaning that even if the toddler topples it over often, it still has a long way to go. What We Love: It is simple to use and it also handles regular bags very well. The Bottom Line: It is ideal for parents working on a tight budget or just looking for something simple that gets the job done without breaking the bank. The Good: The Bubula Diaper Pail is large, and requires emptying very few times. The Bad: It has a steel design which makes it very costly. Since parts like hinges are not made of steel, it can wear down and become useless because it's difficult to find the parts. The Summary: The Bubula Baby Diaper Pail is one of the biggest diaper pails we reviewed. Not only that but once your toddler becomes toilet trained, thanks to its immense size, you can use it as a bin (it actually looks really nice) and comes in a lot of colors we love. What We Love: It looks nice thanks to its 8 color choices, and also allows you to use any bag. The Bottom Line: The Bubula Diaper Pail is ideal for parents looking to do as little emptying as possible thanks to its large size which accommodates a lot of diapers. 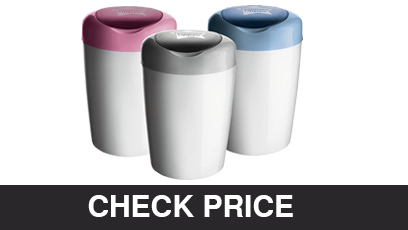 The Good: The Tommee Tipee Simplee Diaper Pail has antibacterial liners that kill 99% of bacteria and other germs. The liners also trap in the odor. The Bad: You have to buy its special refill liners for it to work effectively. And because of it's size (it's pretty compact) you have to change it often. The Summary: While the Tommee Tipee Simplee pail isn't too expensive up front, considering the extra feature of antibacterial liners. The cost of maintenance is high if you opt for its special bags. What We Love: It is compact and can fit in small spaces such as under bathroom sinks, effortlessly which is great for those looking for something a little more compact. 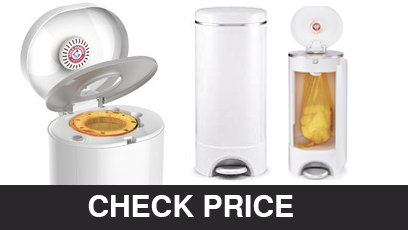 The Bottom Line: The Tommee Tipee Simplee is ideal for parents who want the odor to remain intact as well as a pail that occupies small spaces, such as inside a cabinet. The Good: The Playtex Diaper Genie Complete is considered among the largest pails which can hold up to 270 diapers. And unlike some models, it arrives already assembled so you're ready to go. The Summary: Not only does thePlaytex Diaper Genie Complete hold a huge amount of diapers, but it also the emptying is done via a front tilt diaper bin which prevents any form of spillage so all in all it's a pretty complete system that stands out from the pack. What We Love: Not only do we love the size and the functionality, It also has a carbon filter lining the lid which makes it among the most effective in odor control. The Bottom Line: Ideal for parents who don't have time requiring emptying, very rarely, thanks to its capacity and want something that's good to go right when you buy it. 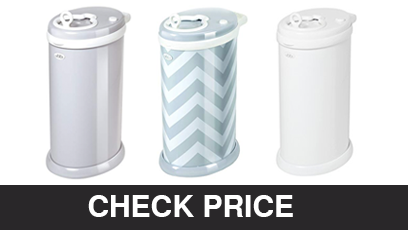 The Good: The Baby Trend Champ Deluxe Diaper Pail is small and has a drop diaper cup where you throw the diapers. After you place it on the cup, you then pull a handle that drops it in the bag. The Bad: It is small, only holding about 30 diapers, which is only like 5 days' worth. The Summary: Although you have to empty it often, it is compact and can be used with regular garbage bags which makes it cost effective as well. What We Love: The drop diaper cup system is effective in shutting odor compared to most of the other models because the lid is only open for a second as the diaper drops to the bag. It's really this that makes me think this is one of the best buys of 2018 in diaper pails. 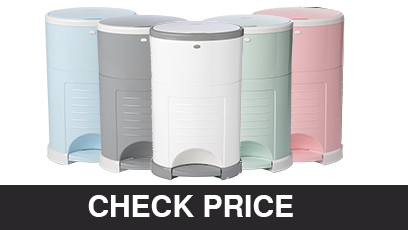 The Bottom Line: The Baby Trend Champ Deluxe Diaper Pail is ideal for those parents who are looking for something unique, compact and economical at the same time. 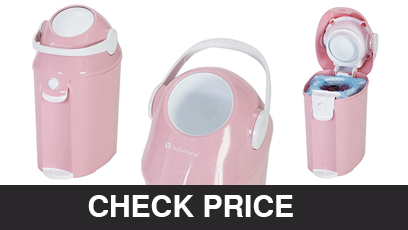 How were these Diaper Pails Reviewed? 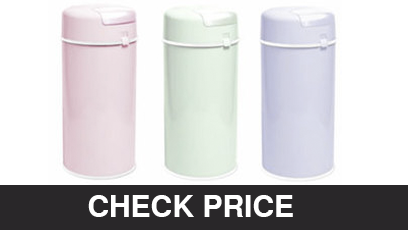 To select the best rated diaper pails we looked at their functionality. Basically, diaper disposal system is preferred to a regular trash can because it is specifically designed to keep out odor. The mechanism is almost similar in all of them but a few stand out because of other factors such as cost and size so digging deeper helped sort which are best depending on what you're on the hunt for, this varies from parent to parent and deserves a deeper dive before buying. The most common factor that determine how well one pail sells from the other, has to be the bags. For some pails, they only function well with custom or special bags manufactured by the pail's brand, this is an important buying factor to be aware of before you buy. What Brands make the best Diaper Pails? Brands such as Ubbi, Dekor, Munchkin, and Genie are at the top of our list. Not only are these some of the highest rated diaper pails but also, they are high quality, will last and customers will go out their way to tell you how great they are. These diaper pail brands effectively address the issue of containing the odor and have some neat functionality systems setting them apart from others we reviewed. For the most part, going with functionality (which works to fit your needs) over brand is the most practical advice when choosing which diaper pail to buy in 2018. With that said, diaper pail brands do matter and should be factored in when making your pick. 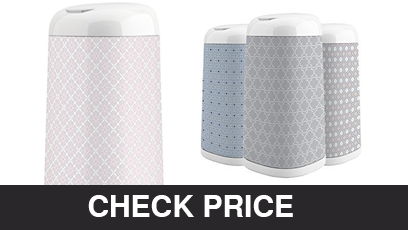 The best diaper trash can (aka diaper pail) we recommend is the Playtex Genie Complete. It is all rounded, both in terms of odor control thanks to its carbon filter lid and it is also the largest, which means that there are fewer emptying days. While this isn't the cheapest or smallest we recommend it for overall checking all the boxes. Attending to toddlers and infants can be hectic and hence in terms of the time effect, you would have to clean and change a bag less often. As much as it is more effective when you use a Playtex genie branded bag, you only have to buy one a month if you factor that the average diapers disposed for one baby is 30, every 5 days. It is cost effective, handles the odor, and saves time, something every parent is looking for in a pail.